Our unique shapes make great giveaways. 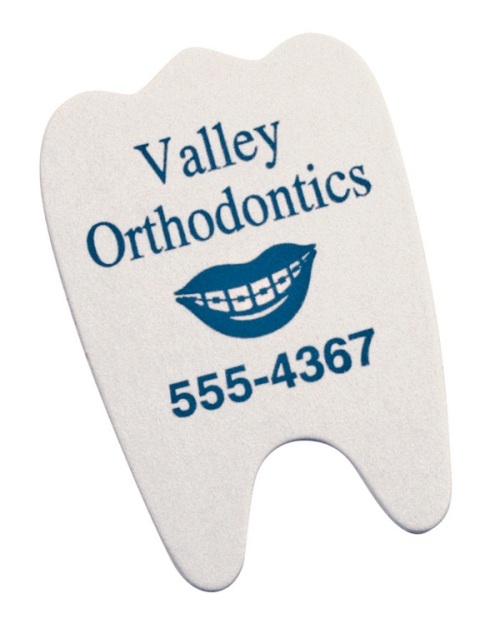 Tooth-shape emery boards are 2 x 3" in size. Prices include straight line typesetting. These emery boards come with a one-color imprint on the front and standard brown sand paper on the back. Standard imprint colors are: red, green, blue, black,burgundy and rhodamine redink. Shipping and handling is free (ground shipping within USA)! An additional $35 non-refundable artwork charge must be paid before work can begin.